- Mirror size: 18" x 12"
- Aluminium handles extend from 20'' to 120''. - Available in 12'' Round Convex Mirror. - Has a heavy-duty extruded rubber rim to help prevent damaging objects when maneuvering. We are counted amongst the leading manufacturers and exporters of superior quality products. These are strictly passed through a rigorous inspection to ensure reliable performance and application specific design. These are fitted with convex mirror, adjustable handle and lighting system to ensure user friendliness. 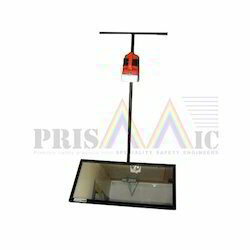 Under vehicle search mirror (trolley mounted mirror) features: 1. smooth castor wheels. 2. easy movement. 3. light weight. 4. size: 2ft x 1ft. 5. trolley mounted with handle. We are the manufacturers and wide offerings of Under car inspection mirror. - 11 dia convex mirror fitted in briefcase. - Castor wheels fitted for easy movement under the vehicle. - For night operation florescent tubes & lamps fitted. - In-built battery backup with charger. Low 3-1/2 inch ground clearance on mirrors with wheels. 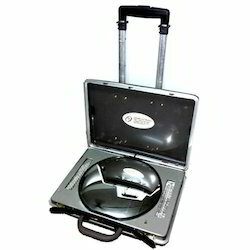 Being a leading firm in this industry, we are manufacturing a high quality range of Mirror Scanner.